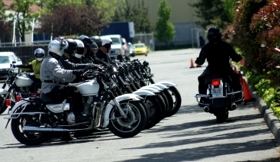 Welcome to Northwest Motorcycle School -- America's premier street motorcycle skills school. Taken directly from the first week of the King County, Washington motor officer training course, and designed by the very retired motor officers that put that course together, our curriculum focuses on the skills you need to maneuver the mean streets. You'll learn the techniques and skills that make motor officers the best street riders out there. No more paddling around, duck-walking bikes through U-turns, or hesitating in tricky tight spots. You'll know what your machine can do, and you'll know how to make your machine do its thing! We don't spend time in a classroom. We start with a couple hours of orientation and theory, and then we're right on the bikes where you'll spend the rest of your forty hours, learning and practicing. Our sequence of exercises is designed to dial you in fast: each exercise provides you with the skill you'll need to tackle the following one. Class sizes are small, and you'll get plenty of time to practice each exercise with instructor feedback until you've got it nailed. You measure your progress using the same benchmarks as motor officers train with. Use our bike; there's no reason to worry about damaging your own while pushing the envelope. You'll practice aggressive braking and escape techniques, high-speed obstacle avoidance skills, and handling your motorcycle confidently in tight spaces. You'll enhance your riding skills, improve your confidence and composure, and increase the enjoyment you find riding your own machine.